When Marie Brenner published her article "The Man Who Knew Too Much", in Vanity Fair in 1996, she had the American public’s full attention. Here was an insight into the mind of Jeffrey Wigand, the man whose life had become public property over the course of a few years. Why? Because he had done the unthinkable; he’d blown the whistle on big tobacco. CBS had come under fire for trying to air an interview with Wigand shot for the news program "60 Minutes" in which he revealed that Thomas Sandefur, the head of Brown & Williamson, one of the seven largest tobacco companies in the country, had lied under oath when he swore that nicotine was not addictive. B&W had fought back, trying to bring both Wigand and the network down and it almost worked. Reading Brenner’s article, you certainly get a sense of the tremendous weight on Wigand’s shoulders and the struggles of a few people to see that he was not buried by the scandal that B&W orchestrated. It seemed inevitable that someone would try to dramatize it. What was missing was the sense that anyone involved was particularly heroic, something writer Eric Roth and writer/director Michael Mann would change when they turned the story into the 1999 film "The Insider," which turns 15 this year. They saw in the struggle a story of burdened men taking on a swaggering, unfeeling villain with nothing to lose. In essence they saw an archetypal conflict not unlike the kind that used to fill the movies of Howard Hawks. Jeffrey Wigand wasn’t always a hero or "Man of the People" (one of the proposed titles for "The Insider"), for many years he was a scientist who made nothing but mistakes and caught no breaks. One of the most telling quotes from Brenner’s article comes at the beginning when Wigand asks the reporter rhetorically, "How would you feel if you had to reconstruct every moment of your life?" Brenner gives us the broad strokes, from Wigand’s upbringing in the Bronx, which gave him the thick skin that ultimately led to his dismissal ("I don’t take too much crap from anybody"), his stint in the air force, his first marriage to a woman who developed Multiple Sclerosis, his first jobs as a chemist and finally to his job at Brown & Williamson. Wigand said he only took the job because he felt he could have made a difference and spent years researching a ‘safer cigarette,’ a project that soon-to-be-appointed-CEO Thomas Sandefur eventually killed. Wigand was told by Sandefur that if "[Brown & Williamson] pursue a safer cigarette, it would put us at extreme exposure with every other product." Wigand came to feel "dirty" and "uncomfortable", but was fired not long after a few major run-ins with Sandefur. One day, he mentioned in passing to an old B&W associate that he was unhappy with his severance package. This made its way back to the higher-ups who considered it a breach in Wigand’s confidentiality agreement. They called him in and agreed to call off the suit if he signed a newer, all-inclusive confidentiality agreement that said in no uncertain terms he would lose all benefits (health, severance, et. al) if he ever mentioned what he saw during his time at B&W. It was about this time that Lowell Bergman received an anonymous delivery featuring safety reports from a Philip Morris company. Bergman was a "60 Minutes" producer who worked closely with Mike Wallace for many years. Bergman couldn’t understand the language of the report so a friend suggested he get in touch with the now jobless Wigand. Wigand reluctantly agreed and soon became a go-to for deciphering corporate speak in major cases involving tobacco companies. B&W got nervous. The death threats began shortly after they got wind of what he was up to, and Wigand retaliated by taping an interview with Wallace, which would be shelved until they could find a way to show it legally. Bergman and Wigand were both hung out to dry and only after a long fight did they come back and air Wigand’s interview intact. It’s not hard to see why the story appealed to Michael Mann. He and Eric Roth, then screenwriter of "Forrest Gump" who reportedly impressed Mann with an early draft of what would become "The Good Shepherd," took Brenner’s article and shaved off a few odds and ends, but they kept its spirit intact. Mann and Roth kept most of the names the same and most of the stories told are true; as Mark Kermode put it in his glowing Sight & Sound review, "It's indeed a surprise to learn the one or two overtly 'dramatic' moments which appear to have been concocted for the benefit of the viewer are lifted directly from fact." Janet Maslin noted in her review for The New York Times that Mann has crafted something memorable from an already dramatic event and praised the way the script "suspensefully [sic] lays out the facts of its story." Facts, not set-pieces. It is quite easy to forget that "The Insider" lies almost entirely in fact (its few departures, including Wigand’s alcohol-fueled fantasy sequence, are much to the benefit of the drama) because of how readily each of the characters falls into a Hollywood mold. It is somewhat difficult to write it off as an old-Hollywood-type film, as Kermode pointed out: "One is tempted to compare it to 'All the President's Men' but that hardly does service to 'The Insider''s brash effrontery. After all, everyone knew that Nixon was corrupt…while Mann's target (the tobacco corporations) is still powerful and on the move." One needs only to look at the closing passage of Roger Ebert’s conflicted but positive review to understand the kind of movie "The Insider" is and the effect it has on viewers. "In its broad strokes, 'The Insider' is perfectly accurate: Big tobacco lied, one man had damning information, skilled journalism developed the story, intrigue helped blast it free. 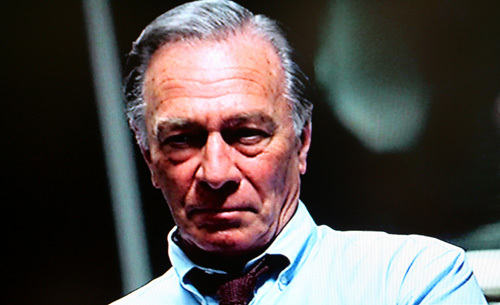 'The Insider' had a greater impact on me than 'All the President's Men,' because you know what? Watergate didn't kill my parents. Cigarettes did." However real the events of "The Insider" are, it’s important to remember that if Mann weren’t so keen a director, the facts would hardly matter. 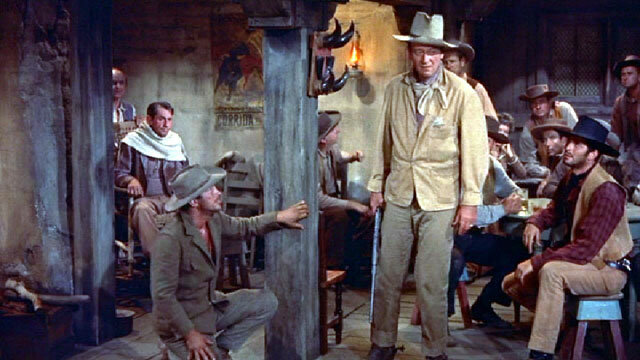 It can be no coincidence that "The Insider" so closely mirrors Howard Hawks’ lackadaisical western "Rio Bravo," about the defense of a jail by a sheriff and his ragtag gang. Roth and Mann turn their real-life heroes into the stuff of legend, or at least classic movie lore. 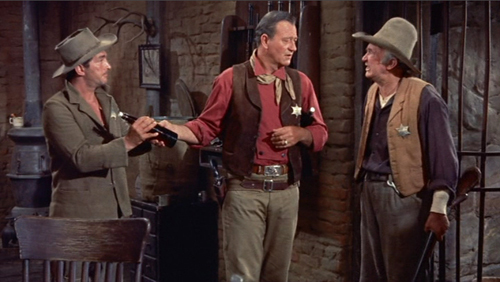 Lowell Bergman plays the part of John Wayne’s unshakable sheriff Chance, the hero of "Rio Bravo"; Wigand the shaky alcoholic Dude played by Dean Martin with Mike Wallace as Stumpy, the aged jailer played by Walter Brennan. Wigand’s salvation lies in his owning up to his problems; his alcoholism, like Dude’s, is a problem that prevents him from meaningful relationships. Both men are seen at their worst succumbing to drink. Bergman is at once irascible and stone-faced, always in charge even when he’s outgunned. When he is cornered he always finds a way out. Interestingly, when Chance finds himself surrounded by henchmen trying to free a well-connected prisoner, he’s saved by the intervention of a female character; Bergman’s assistant Debbie (Debi Mazar) digging up a memo regarding CBS’ sale to Westinghouse which a B&W lawsuit would jeopardize has the same impact on the action as Angie Dickinson throwing a flower pot through a window to distract the men who’ve cornered Chance and comes at roughly the same point in the story. The women in "The Insider" are every bit as cunning as the men, even if they’re given less screen time. Just as Feathers is as useful a part of Chance’s operation as Stumpy or Dude, Bergman’s assistant and his wife are often more useful and smart than Mike Wallace, and certainly less of a liability than Wigand. When Bergman talks to his wife, she is on his wavelength 100% and can sort him out with a few carefully chosen words. Wallace, on the other hand, mentions that, at his age (almost 80), he needs to think about his legacy. Similarly, Stumpy the jailer demands to be taken seriously in response to being called ‘an old cripple’ throughout. In the end, Stumpy proves his worth by aiding Chance in a final show-down in the same way that Wallace eventually concedes that Bergman was in the right and helps him air the uncut interview with Wigand. But this only comes after he’s threatened with the possibility that his name will be tarnished. "Fame has a fifteen-minute half-life. Infamy lasts a little longer." Every character in "The Insider" strives to join what Robin Wood calls the Hawksian ‘Self-Esteem Club.’ In his book on "Rio Bravo" for the British Film Institute Classics series, Wood underlines the motivating factor behind most of Hawks’ heroes. What the characters in "The Insider" and "Rio Bravo" really strive for is "self-control, the means to the achievement of self-respect, a value...central to the Hawksian System...They need a 'cause'." Causes are what Bergman finds for a living. Crucially, Wigand and Bergman, and those who help them (Attorney General Michael Moore and the two trial lawyers who aided him, Ron Motley and Richard Scruggs, Wallace at his better moments, Palladino & Sutherland) are not heroic; they clearly enjoy the challenge and will occasionally do slightly unscrupulous things in the name of a greater good. Wood again: "They are not crusaders, they are not altruistic beyond a necessary belief in justice. They undertake their 'duties' as a test, to prove themselves to themselves, and for that they also need the acknowledgment of others." Wigand’s triumphant day in court, Bergman’s unveiling of the corporate headlock preventing his show from airing, Wallace’s eventual siding with Bergman, and Moore, Scruggs and Motley’s efforts are framed as battles for their own convictions as much as for an external cause. The film’s Western credentials come to the forefront in the film’s best scene. After a tense decision to give his deposition in a Mississippi court room, Wigand arrives in the middle of Motley’s trial. Bruce McGill who plays Ron Motley starts the scene against the wall. Wings Hauser, shining in his one scene as an eel-like defense attorney, reminds Motley that what he’s doing is illegal and that getting Wigand’s testimony is against his confidentiality agreement. His mistake isn’t reminding Motley of the truth or his hostile tone, his mistake is laughing as Motley tries to outmaneuver him. Sheila O’Malley has written before about what an incredibly gifted performer McGill is, citing this scene in particular. It’s the closest the film has to a gunfight. Hauser lets his lips curl into a condescending little grin and McGill catches him. "Wipe that smirk off your face!" he shouts, and the room falls quiet as a tomb. McGill draws down on him and lets out a cry for sanity and compassion as powerful as a slug from a Colt .45. Hauser doesn’t speak again. Wigand continues. For a film without a single act of violence (though crucially a lot of guns brandished by soldiers, cops and extremists), it doesn’t get much more OK Corral than that. It wasn’t that McGill’s case would fall apart if he let Hauser stop him from getting the testimony he needed, it was that he would lose his self-respect if he let the worm get one over on him. Just as Dude and Chance are the yin to the other’s yang, Bergman and Wigand are placed in equal compositional spots to each other. The old story is that Hawks made male love stories, so it can be said that "The Insider" is about the affair between Bergman and Wigand, an acceptable friendship. They are framed similarly, both wear old, broken-in clothes, both are family men, they seem to understand more about each other than it first seems (Bergman more than once seems to read Wigand’s thoughts), they argue like an old couple, as when they end their final dialogue with this mutual exchange of praise: "I'm runnin' out of heroes. Guys like you are in short supply" "Yeah, guys like you, too." It may be a very Mann line, the gruff urban diction off-setting its sentiment slightly, but it could fit into just about any Hawks movie. This is primarily a man’s story, full of swaggering John Wayne stand-ins and scenes that seem pulled from the old west as directors like Hawks, John Ford and Anthony Mann imagined it. Ron Motley’s shouting down his opponent in court, a truly galvanizing display by actor Bruce McGill, Wigand’s wordless ride to the courthouse to give his deposition set to a musical theme that recalls Ennio Morricone’s "Il Tramonto" from the western "The Good, The Bad, and The Ugly," a trip Russell Crowe, who plays Wigand, would repeat in James Mangold’s "3:10 To Yuma," and finally Bergman’s exit, his coat flowing behind him as he rides off into uncertainty like Clint Eastwood’s Man with No Name. Mann’s meticulous directorial style applied to such a carefully constructed screenplay resulted in one of his finest films. "The Insider" may seem like an anomaly in Mann’s filmography, riddled with thieves, gunmen and cops on the brink, but they all share a Hawksian sense of men staring down convention and overwhelming odds. The Nazi soldiers stationed at a remote Romanian Castle doing battle with an ancient evil in Mann’s only horror film "The Keep" call to mind the military men stationed at the end of the world fighting an alien and Antarctic conditions in Hawks’ only horror film "The Thing From Another World." James Caan’s short-tempered hero in "Thief" feels like an update of the kind of men Humphrey Bogart played for Hawks in "The Big Sleep" and "To Have & Have Not" complete with criminal conspiracy and a female foil who’s every bit his equal. Mann paid homage to Hawks’ "Scarface" with "Public Enemies," both of which are about charismatic, depression-era gangsters. They also share a fondness for often eccentric details that say more about their characters than exposition. Chance kissing Stumpy on the forehead, flustering him so greatly he falls off his chair, has nothing to do with the story of four men and a woman keeping a prisoner in jail, but it has everything to do with what Hawks cares about: those five individuals. There’s a rhyme in "The Insider" when Wigand calls Bergman from the hotel room where they first met to covertly. "Our favorite hotel, honey." Wigand still has a sense of humour, which is crucial for Mann sympathizing with him. Watching Wigand’s awkward introduction to his new chemistry class ("you can call me Mr. Wigand, Dr. Wigand or Jeff. Anything else you want to call me you’ll have to do so in private. "), Wallace’s shouting down an interview subject’s bodyguard ("Do you think I’m a 78 year old assassin?") and Bergman flying down to Wigand’s house to tell him he didn’t sell him out to Brown & Williamson ("I don’t burn people") have equal heft because they give us insight into the characters, which means as much to Mann as the specifics of the story. Or rather, their characters are the story. "The Insider" came at the end of a cycle of legal thrillers that dominated theatres in the 1990s. Movies like "Presumed Innocent," "The Client," "The Firm" and "A Time To Kill" show varying degrees of restraint in their courtroom theatrics, but they can’t compete with Mann’s highwire act of truth vs. cinematics. 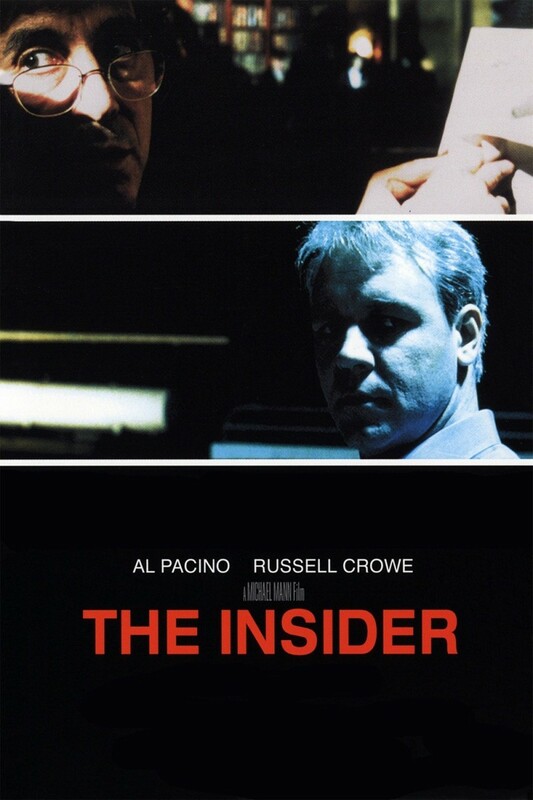 "The Insider" took the genre out on a high note, treating the case of Wigand Vs. Brown & Williamson like one of Mann’s nocturnal, surveillance-obsessed crime stories, explosive verbal confrontations standing in for gunfights. Mann had not before and has not since produced a political thriller and his sense of characterization has never been as sharp because he never cuts away to ‘action’. Watching boardrooms full of prickly professionals or bedrooms occupied by Bergman, his wife, and their children from previous marriages talking over each other, has the ring of Hawks’ beautifully labyrinthine, conversational flow. The stories of Bergman and Wigand close with both men having proved ‘themselves to themselves’ to quote Wood, and, though what lies in store is uncertain, Mann and Roth manage to find a happy ending to a story that hasn’t had one and yet it doesn’t ring false. To reach into a story as uncompromising and unbelievable as this, so full of heartbreak and paranoia, and find a way for its two heroes to walk away with their dignity is no small feat. It pulls "The Insider" from the realm of the ordinary and into the upper echelon of great cinema.